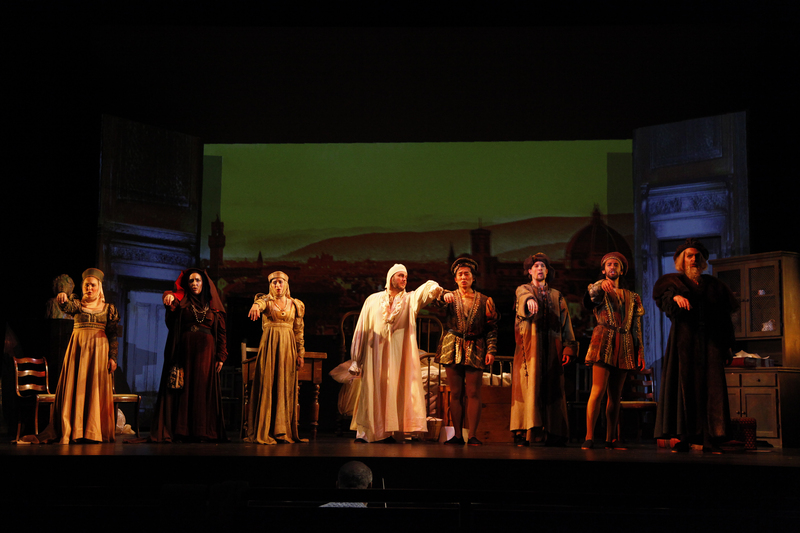 On the afternoon of Sunday, July 9th at the Kaye Playhouse at Hunter College, the 600 plus audience was treated to two gems from Giacomo Puccini’s Il Trittico. 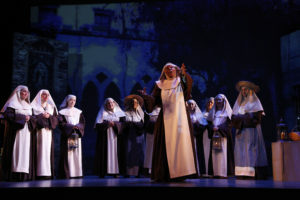 Suor Angelica provided the tears and Gianni Schicchi the laughter. Il Trittico premiered at the Metropolitan Opera in New York City on December 14, 1918 to mixed acclaim but Gianni Schicchi was highly praised. 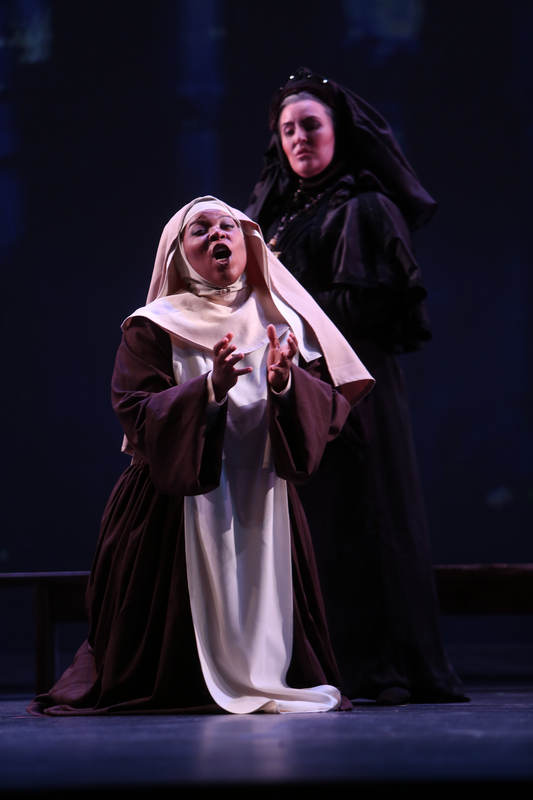 Il Tabarro and Suor Angelica have come up from behind and have also earned praise as the masterpieces they are. Acclaimed Metropolitan Opera (Met) tenor Richard Leech lauded the vision, talent and passion of the young singers and the importance of those who help support the Martina Arroyo Foundation. The young awardees are given an intensive six weeks of training and voice and stagecraft lessons as well as a stipend. They are then presented in opera, fully costumed with orchestra and fully staged before an audience at the Danny Kaye/Sylvia Fine Kaye Playhouse (Named after the immortal Brooklyn comedian and humanitarian and his lyricist/composer wife) as part of Prelude to Performance of the Martina Arroyo Foundation. Mr. Leech quoted from Molière, “Of all the voices known to man, opera is the most expensive.” Maestro Willie Anthony Waters lifted his baton as conductor and the magic began, with the simple setting of a fountain, a statue of the Virgin Mary, a flower garden and the nuns. Artful in its simplicity, the nuns evoked innocence and devotion. The story takes place in the convent courtyard in Italy in the late 1600’s. The whispering among the nuns said that Suor Angelica had come from a wealthy family and was sent to the convent seven years ago. She became the pharmacist and her herbs and potent potables were of value to her fellow sisters at the convent. A visitor arrives and word spreads that the visitor was a lady in a royal coach with a family crest. The Mother Superior sends for Suor Angelica and tells her that her Aunt, the Princess, wants to speak to her. Angelica and La Zia Principessa are given time and privacy in the Virgin’s chapel. The Aunt wants Suor Angelica to sign over her share of the property because Angelica’s youngest sister Anna Viola is getting married. Suor Angelica then asks how her young son (born out of wedlock) is. Zia tells her that he died of a fever two years earlier. Angelica screams and falls in a faint. Zia Principessa turns her back and prays. Angelica is bereft, signs the deed and Zia leaves. Angelica mixes a poison potion for herself and drinks it but regretting her suicide prays for forgiveness. 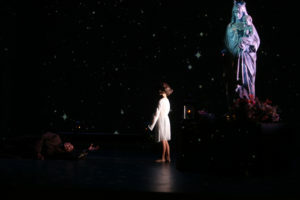 The Virgin statue glows, the stars in the heavens shine brightly, as Angelica’s child appears and welcomes her to heaven. Michelle Johnson was Suor Angelica. Ms. Johnson’s acting was stretched to the limits but was never overdone. Her emotions were imploding and exploding yet with a sense of humility that touched the heart and tear ducts. Ms. Johnson’s exquisite singing of “Senza Mamma” had the true essence of an Italian soprano with generous volume and a heartrending outpouring of glorious sound. Ms. Johnson hit the final note “Amore” in a mezza voce and held it until it became a golden thread to paradise. Suor Angelica’s child (Akari Wientzen) walking towards her with arms outstretched in her final moments was indelible. The composer Puccini, whose sister was a nun, would have savored this moment, and I am certain he applauded from his domain in heaven.The touching libretto was by Giovacchino Forzano. La Zia Principessa was stunningly sung by Leah Marie de Gruyl whose dark penetrating mezzo and stone cold persona left a chill in the room. La Zia had the righteous might of the old testament but none of the mercy of the new! She could not forgive nor forget Suor Angelica’s transgression and the family disgrace. Once she turned to comfort but recoiled, she was incapable of doing so. Melanie Ashkar had the proper balance of sternness and compassion as La Maestra delle Novizia. Her flexible warm mezzo soprano was a perfect barometer for her character and assigned duties. Molly Burke, Jenna Buck, Renée Richardson, Crystal Glen, Nicole Rowe, Yulan Piao, Amy Guarino, Wan Zhao, Hilary Hei Lee Law and Maria Zollo rounded out the ensemble and sang and acted with heavenly perfection. Their singing with the chorus of “Regina Verginum, Salve Maria” was truly the beacon to heaven’s door. 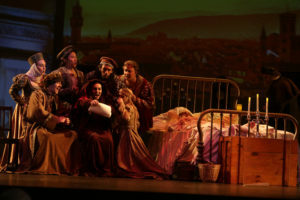 The second portion of the evening was the brilliant comedy Gianni Schicchi with a libretto also by Giovacchino Forzano. The story takes place in Florence, Italy in the year 1299. In the middle of their mourning the death of their wealthy relative, Buoso Donati, his greedy relatives hear gossip suggesting that he has left all of his possessions to the monks of the order of Saint Reparata. Rinuccio suggests that they hire Gianni Schicchi, despised newcomer to Florence who knows the law, be chosen to help them get the money. Rinuccio is in love with Lauretta, Schicchi’s daughter. Rinuccio sings “Fiorenza come un albero fiorito.” Spencer Hamlin’s brilliant tenor rang out on the top notes ending with the name of “Gianni Schicchi” with fervor! The wily Schicchi pretends to be the still dying Buoso. Before playing his role, he tells the family that to lie with wills means getting your hand chopped off and banishment from Florence. “Primo un divertimento” was robustly sung.” Schicchi indeed gives some property to family members but he leaves the main home, mules and grounds to himself waving his sleeveless hand at them whenever they protested. It ends with the greedy family leaving after attacking the house and the young lovers happily singing a love duet “Lauretta mia, staremo sempre qui” with the city of Florence in full view. 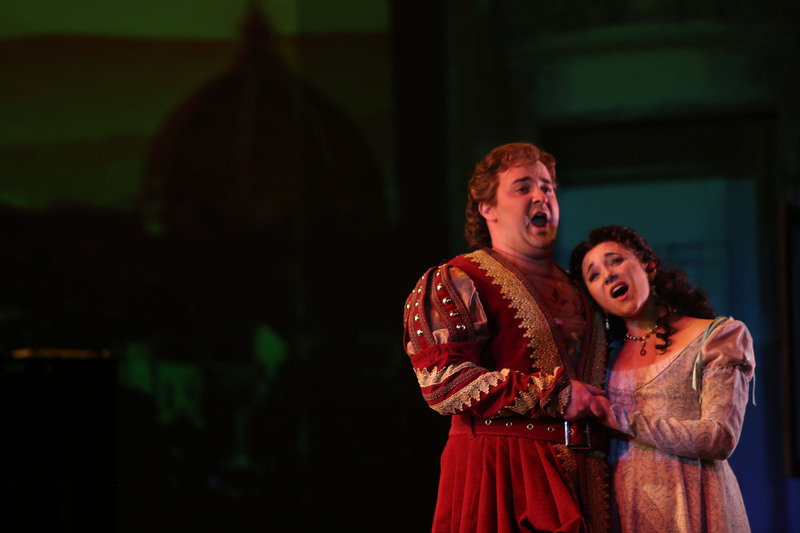 Hamlin’s vibrant tenor and Ms. Whiteway’s lovely soprano soared ecstatically. Schicchi then addresses the audience that even if he goes to hell (As Dante placed him) that it was worth it! Joshua DeVane was an excellent Gianni Schicchi and he used his warm vibrant baritone and expressive acting to the fullest. He truly relished the part! Lauretta was in the pretty and perky package of Anna Adrian Whiteway and her singing of the iconic “O mio babbino caro” was enchanting. Ms. Whiteway’s charming soprano has a pungent fullness that made all eyes and ears, hers! Steven Mo Hanan was the dead Buoso and was remarkably funny with his Buster Keaton deadpan schtick! The versatile Leah Marie de Gruyl was hilarious as Zita. Ms. de Gruyl’s amber dark mezzo has all the colors of the rainbow replete with a pot of gold! Vincent Grana was excellent as Simone, oldest relative and the former Mayor of Fucecchio. His plangent bass-baritone and comedic gestures were truly evocative of the Italian theatre. 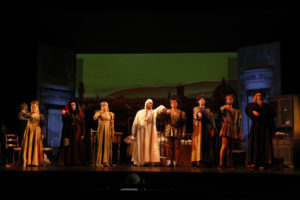 All of the “grieving” greedy relatives were sung and acted with aplomb including Melanie Ashkcar as La Ciesca, Nicholas LaGesse as Marco, Nicole Rowe as Nella, Hao Hu as Gherardo, Frida Werner as Gerardino, Karl Buttermann as Betto, while dual roles were played by Ben Reisinger as Spinellooccio and Notaio and Charles Carter as Pinellino and Guccio. Maestro Willie Anthony Waters conducted the 30 splendid orchestra musicians in a performance that was perfection from the ascending majesty of Suor Angelica to the brassy, brilliant and modernistic insouciance of Gianni Schicchi. The versatile chorus rose to heavenly heights in Suor Angelica and captivated throughout and in Gianni Schicchi as well. Ian Campbell’s stage direction was perfect from the calm of the convent to the merry mayhem of Gianni Schicchi! Charles Caine’s costumes were comforting in the convent and colorful in Gianni Schicchi and brilliantly brought out two aspects of life in Italy centuries ago. Steven Horak’s wig and make up were colorful, garish when needed and versatile. Even the dead had lustre! Plaudits to Joshua Rose, set and lighting designer. The glowing Virgin statue still glows in memory! The audience stood up as one and cheered to the rafters for both operas and both casts bathed in the glow of the ovations for the final bow. Opera lovers who witnessed these superb performances did better than if they flew to Milan to the opera house at La Scala. New York City and the Kaye Playhouse was the place to be for opera at its finest. No “updates,” “no nonsense,” (nunsense) – just wonderful opera as the composer intended it to be. It was nice to see friends from the Martina Arroyo Foundation, Met Verdi baritone and Administrative Director Mark Rucker and his wife and accompanist Sadie, Publicity, and Norena Barbella, Development Consultant, as well as many friends from Opera Index, The Gerda Lissner Foundation and others. There was a special memorial page for the much loved and invaluable recently deceased coach and accompanist Joan Krueger. It was a joy to witness two incomparable performances of Puccini at his best in Prelude to Performance. The indomitable spirit of our guiding light, Martina Arroyo prevails. 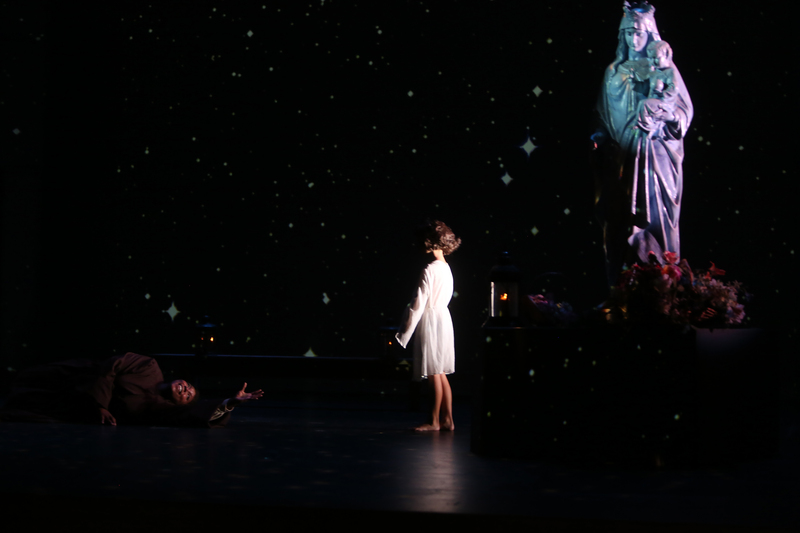 She is our everything and to witness this type of thrilling performance by these future stars nurtured by the Martina Arroyo Foundation makes us all ennobled and elevates humankind with the beauty and the art of opera! A “toast” to Martina Arroyo and all involved in Prelude to Performance. Here’s to Prelude to Performance 2018! We look forward to the Martina Arroyo Gala at the J.W. Marriott Essex House on Monday, November 13th when Met opera’s great basso James Morris and promising soprano Ailyn Perez and Broadway legends, Chita Rivera and Tommy Tune will be honored!